Update: 6:10: He hated the bird baby food, but it awakened his appetite and he ate the regular bird food he initially scorned. Plus I got a lot more water in him via syringe. So yay! 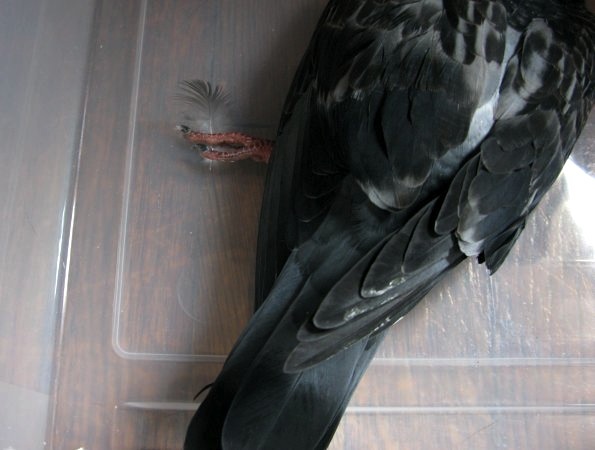 Haven’t heard back from the pigeon rescue group, but it is Sunday. And I’m heartened by his appetite. He was so uninterested at first. It has to be a good sign. Update: 4:45: Back from Petco with regular food and also formula for baby birds in case it doesn’t eat the regular food and I have to feed it with a syringe. Update 2:50: I called my vet and the tech explained how to feed a pigeon with a syringe. 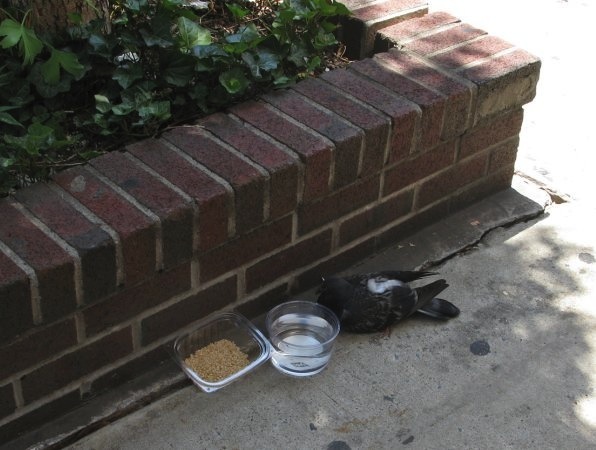 I just successfully fed some water to the pigeon! Made me ridiculously happy. Will try baby food later. … but he didn’t drink, even though I tried the trick Frank suggested. I fear he might be too far gone. His leg is very unnaturally splayed as you can see in this picture. When I picked him up he barely resisted. Poor little thing. Now I’m home worrying and waiting to hear back from someone. Seriously, I wish I wasn’t the way I am, but I couldn’t just leave him. I’m just like you: will rescue any critter I find sick. I used to raise ring-neck doves (as pets), which are very similar to pigeons. Doves are the most gentle birds ever, easy to handle/hold. Not sure about pigeons, but sending good luck to you and the pigeon. Poor baby! Thank you for the encouragement. I felt so happy when I successfully got him to drink water via the syringe. It was the best feeling in the world. I could happily do this for the rest of my life. When recently in Maine I attended a meeting where they had bird rescue people come to speak. They brought two falcons and an owl. One Redtailed falcon had to have it’s wing amputated due to a gunshot wound. They’ve been taking care of it for years. It always goes “on tour” with them for these presentations. I’ve now learned how to hand feed the pigeon and I’m loving it. If I didn’t have a cat I’d volunteer to be a foster. They’re willing to train people how to foster, they’re very over-run. 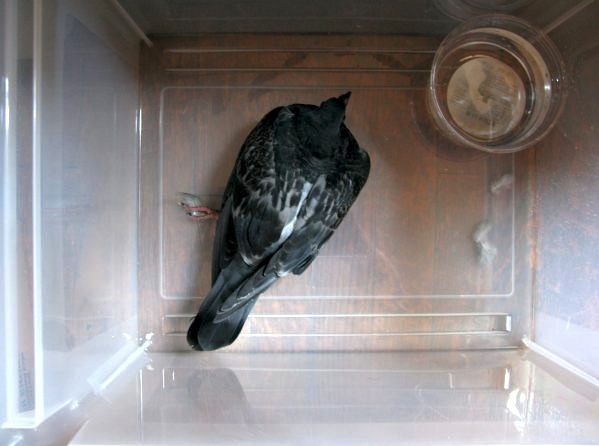 I have also found a sick bird and he had been sitting like that all day outside on my porch. We put him in a warm box and brought him in to keep him warm. We have absolutely no idea what to do now. Any suggestions? I have links on the post above to places that have suggestions.